Black-crested bulbul Pycnonotus melanicterus, copyright Don-Jean Léandri. 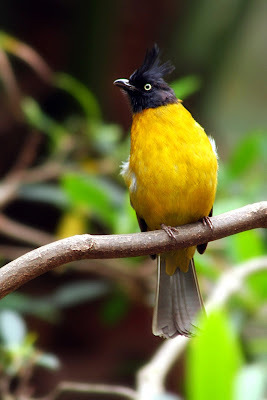 Pycnonotus is a diverse genus of bulbuls found in Africa and southern Asia, with the higher diversity of species in the latter. [S02] Santharam, V. 2002. Fruit and nectar resources in a moist deciduous forest and their use by birds—a preliminary report. Journal of the Bombay Natural History Society 99 (3): 537–543.